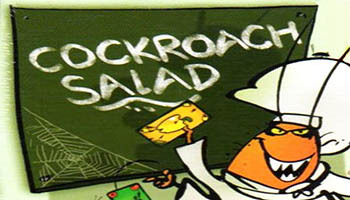 In Cockroach Salad players create a common salad packed with lettuce, peppers, tomatoes and cauliflower - but they won't always be saying which ingredient they're adding to the bowl! The 128 cards - 120 vegetable cards in the four types and eight "taboo" vegetable cards, two of each type that bear cockroaches - are shuffled and divided among the players. If his vegetable matches the previously played vegetable, the player must lie. If his vegetable matches the claim made by the previous player (perhaps because that player lied), then the player must lie. If he plays a taboo card, he shouts "Cockroach!" and the next player starts a new pile next to the first one so that the taboo card remains visible. If his vegetable matches a visible taboo card, he must lie.